The Vancouver Condo Buzz » PROJECT OF THE YEAR! New Burnaby MODELLO Metrotown Condo Tower Launching Previews! Luxuriously Appointed 1, 2 & 3 Bedroom Modello Burnaby Condos for Sale! « Boutique West Side Vancouver EMPIRE at QE Park Condos for Sale! LEED Gold Certified 1 -3 Bedroom EMPIRE Vancouver Condos & Townhouses Available! Striking doesn’t do this new Burnaby condo high-rise justice! We believe that 37 storey MODELLO Burnaby condos by Boffo is the most unbelievable Metrotown real estate development this year by far, and for great reasons! The new Burnaby MODELLO by Boffo condos will undoubtedly be Metrotown’s most exclusive residence and most coveted address. The art of elegant living at MODELLO Burnaby condos is all about luxury interiors, five star amenities, an impeccable transit oriented location and much more. Not only that, but the pre-sale Burnaby MODELLO condo tower is brought to you by the same developer as the award winning Jewel and Jewel II high-rises, Boffo. As the marketing suggests, the condominium interior standard features and upgrades elsewhere. Five star elegant fine living at its best is coming right now at the advanced previews starting mid-October 2013! Luxuriously appointed 1, 2 and 3 bedroom condominium homes will be offered at the grand opening! As part of the master revitalization of the area, the new Boffo MODELLO Burnaby condos for sale will be located at Beresford and Willingdon which will provide residents easy access to all the entertainment, shops and restaurants at Metrotown in addition to living in an exclusive and quiet neighbourhood near Central Park. As well, the Boffo MODELLO Burnaby Metrotown condo tower will be part of the proposed Beresford Art Walk which may be expanded to include pedestrian friendly walkways, beautiful streetscapes, street level art, cafes, dining and even entertainment. The previews for the pre-sale Burnaby MODELLO condos for sale start mid-October and you can find out more online at www.ModelloByBoffo.ca today. The Modello presentation centre is located off-site at Unit 118 – 5021 Kingsway Burnaby (at Marlborough). The art of elegant living is now available here at Modello by Boffo! Some of the amazing interior features include nine foot over height ceilings, recessed LED lighting for energy conservation, marble backsplashes in both the kitchens and bathrooms, custom millwork throughout and air conditioning! Not only that, but home buyers will also be very pleased with the high-end wide-plank hardwood flooring throughout the main living ares and heated marble flooring in the bathrooms. The kitchens at the new Burnaby Modello Metrotown condos will be fully loaded with high-end finishes. This includes a Miele appliance package including a stainless steel gas cooktop, modern wall oven, fully integrated dishwasher and a large 36 inch fridge with integrated custom panel finish and freezer. As well, the kitchens at the new Modello Burnaby condos for sale will include a separate wine fridge as per floor plan. As you can see already, many of the ‘standard features’ at Modello by Boffo are upgraded items in other developments. Not so here! Other incredible features include the large terraces and outdoor living spaces for all floor plans! So not only are the interior floorplans very spacious, but they also extend outward and provide residents from all exposures and levels incredible views of the city and beyond. Depending on the unit and level at the Boffo Modello Burnaby condo landmark tower, you can have views straight out to Central Park, Metrotown, downtown Vancouver and even the North Shore mountains. Five star living coupled with environmentally friendly features make Modello Condos a compelling choice for your next home. Another amazing feature of this Metrotown high-rise tower is that there is state of the art geothermal heating and cooling technology. As well, the location is ideal for people who don’t want a car to get to and from places. This truly liveable neighbourhood is right next to Metrotown and is considered one of the best transit oriented master planned condo communities not attached to a high volume traffic area. That’s the best thing about the location! You essentially live in a quiet enclave, but just next door is mass transit that can get you to downtown Vancouver or YVR within minutes! The new Metrotown Burnaby Modello condos for sale will also feature a rooftop amenity space with a full fitness gym, whirlpool, private dining area, clubhouse lounge with a catering kitchen and a landscaped roof terrace deck with incredible views. The site location for Modello by Boffo condos is at Beresford and Willingdon Burnaby. ADVANCED PREVIEWS ARE ON NOW at the Pre-Sale Burnaby Modello Condos! A striking new landmark tower is coming to the Burnaby Metrotown neighbourhood. 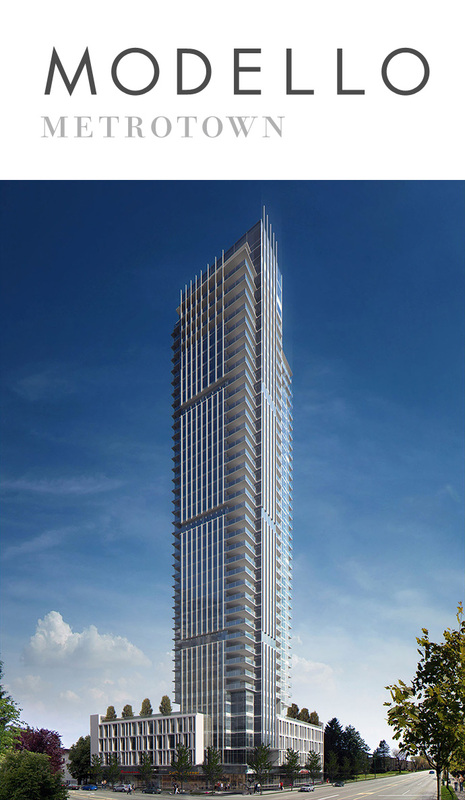 Called Modello Burnaby, the tower will be situated at Beresford and Willingdon in Metrotown. Modello is brought to you by Boffo and it follows the highly successful Jewel I and II high-rise towers that are just a block away from this new project. 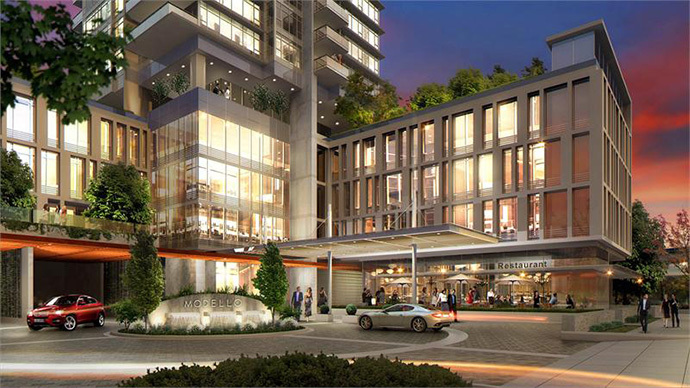 The elegant Metrotown Burnaby Modello condo tower is scheduled to launch VIP previews in Fall 2013. Here, Boffo will announce a 37 storey landmark Burnaby condo tower with only 170 high-end apartment residences for sale. The presale Burnaby Modello floor plans will range between 623 (six hundred and twenty three) to 1,706 (one thousand seven hundred and six) square feet, which makes them some of the most spacious layouts in the Metrotown real estate district. The 37 floor tower will be situated on an impressive podium of 4 floors and the upscale living spaces will feature luxurious specifications never seen in this market. As well, a covered breezeway connects Beresford Street with the residential and office lobbies. In addition, the Boffo transformation of this Metrotown Burnaby neighbourhood will see the addition of cafes and restaurants in addition to a possible wine bar with outdoor patio. The new Modello Burnaby condo tower is the newest and most exciting addition to the Metrotown real estate district in years. Make sure you register your interest for the Boffo Modella Burnaby condos at www.ModelloByBoffo.ca today for more advanced preview information. Following on from the success of Jewel I & II, Boffo’s newest project will be located just a block away from the Jewel towers. 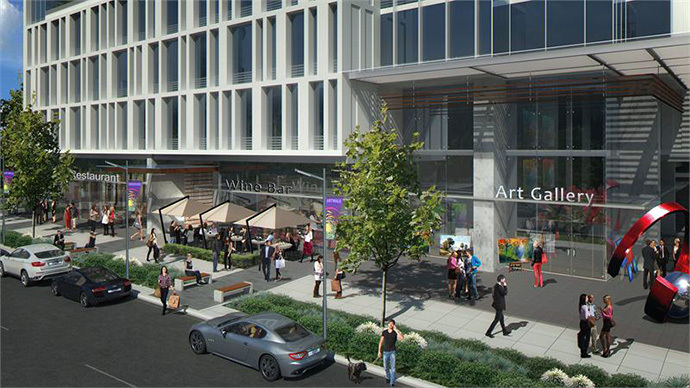 This development will be carefully integrated with the City’s exciting new plans for the art community in Burnaby.